Larger breeds and cats are less commonly affected. Most pets are born with the condition but occasionally it is caused by trauma. It typically results in intermittent hindleg lameness which progresses slowly over months to years. The patella (knee cap) is found within the patellar ligament which attaches femur muscles to the tibial tuberosity. When properly aligned, as seen at left, the patella tracks in the femoral groove and gives the knee stability and normal function. When improperly aligned, as seen at right, the patella “pops out” of the femoral groove. Refers to the condition which occurs when the knee cap “pops out” or dislocates out of the femoral groove. Usually the result of misalignment of the tibial tuberosity with the patellar groove at birth. Occasionally, a traumatic event results in luxation of the patella. The patella can luxate toward the inside (more common) or outside of the knee (less common). As a result of luxation, the femoral groove becomes shallow and narrow. 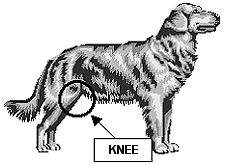 Knee instability, pain, lameness, joint swelling and eventually arthritis result. Some animals with patellar luxation also have other knee abnormalities such as cranial cruciate ligament rupture. Many dogs need surgical repair for resolution of lameness. A successful outcome with surgery is expected in 90-95% of cases. Even with surgery, some arthritis will develop in the knee. The faint scar remaining after surgery usually becomes covered with fur again. An overnight stay is required so discomfort can be controlled with injectable pain medication. Relieve pain associated with the patellar luxation. Prevent damage to ligaments and cartilage within the knee. Decrease the amount of arthritis which will inevitably develop in the knee. Limit stress put on the opposite limb and other limbs and joints. Exploration of the knee joint to identify any ligament or cartilage damage. Realignment of the tibial tuberosity with the femoral groove. Formation of a normal femoral groove by deepening and widening it. The recuperative period typically lasts for a total of 8-12 weeks. Pets gradually begin to put weight on the operated leg over the first 14 days. Physical therapy comes in the form of progressively longer leash walks over the following weeks. Initially, exercise is limited to walks to eliminate only. Skin sutures are removed 10-14 days after surgery. Exercise on leash is gradually increased over the following weeks; swimming is also excellent exercise. Pain medication and antibiotics are administered for several days after surgery. No running, jumping or playing is permitted for at least 8 weeks following surgery. Most pets are permitted to resume normal activity several months after surgery. 5-10% of dogs have lameness after surgery which is controlled with medication. Occasionally, pins placed as part of the realignment procedure need to be removed. Rarely, infection after surgery makes additional surgery necessary. Cost for surgery is dependent on pet weight and typically includes examination, pre-anesthetic bloodwork, anesthesia, surgery, hospital care, post-operative medications, and two follow-up examinations. Please ask your veterinarian for a detailed surgical estimate for your pet.